The case for tax reform is clear. The policies of the Obama administration, which focused on increasing tax and regulatory burdens, didn't help improve the lives of the American people. 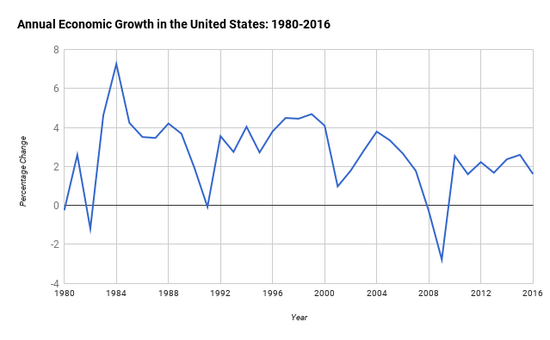 The economy hasn't seen annual economic growth of 3 percent or higher since 2005 and wage growth still hasn't risen above its pre-recession levels. On Wednesday, House Ways and Means Committee Chairman Kevin Brady (R-Texas) is expected to unveil the legislative text of a tax reform bill. While the framework provided guidance, the legislative text will fill in the details. The committee is expected to begin the markup of the bill on Monday, November 6. Some House Republicans, mostly those from New Jersey and New York, and crony special interests have pushed back on the framework because of the proposed elimination of the state and local tax (SALT) deduction. Under current law, taxpayers who itemize can deduct their state income, sales, property, and real estate taxes. This deduction brings down the amount of taxable income. It's likely that the text of the bill won't eliminate SALT. Chairman Brady has been working to address the concerns of these members, possibly capping the deduction at a certain income threshold or allowing taxpayers to deduct their property taxes. Still, a discussion over the SALT deduction, which has existed as long as the income tax, is one we should have. But before we dive into this discussion, it's worth keeping in mind is that only 29.6 percent of tax filers itemized in tax year 2014, the most recent year data are available. Tax filers who earned $100,000 or more in 2014 represented roughly 16 percent of all tax filers. Of tax filers with incomes of $100,000 or more, 81 percent itemized over claiming the standard deduction. 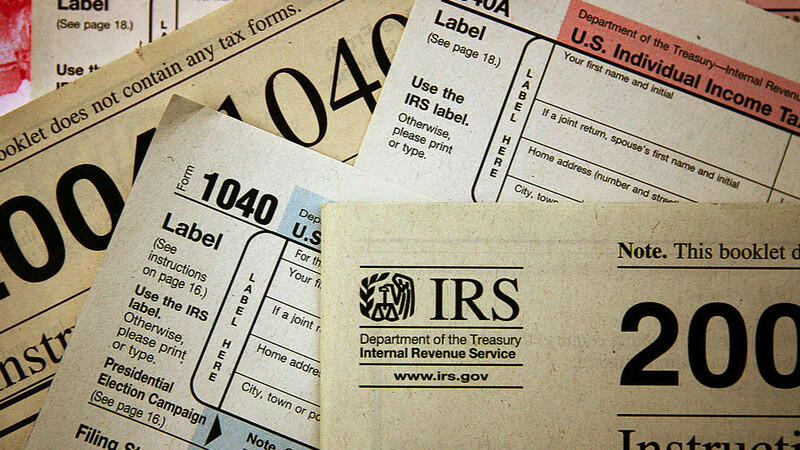 These income earners represent almost 44 percent of those who itemized their deductions. One of the key goals of tax reform is to eliminate as many tax deductions as possible to both broaden the tax base and use the revenue from the elimination of deductions to lower tax rates. 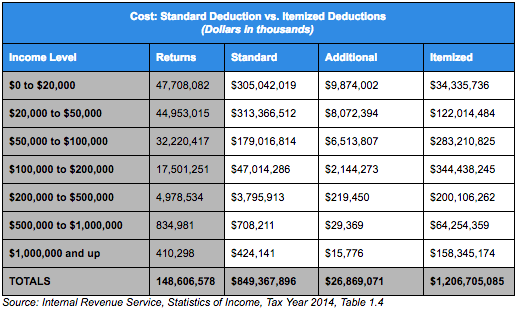 The standard deduction, additional deductions, and itemized deductions "cost" roughly nearly $2.083 trillion. The proposed framework includes a near doubling of the standard deduction, to $12,000 for individuals and $24,000 for families, to offset the impact of the elimination of popular deductions. As Ryan Ellis has shown, this means that middle class families will see a pay raise, as their taxable income will be substantially lowered. The SALT and mortgage interest deductions are among the most popular utilized by those who itemize their tax returns. In 2014, these deductions "cost" nearly $799 billion, with the deduction for state income tax coming in with the highest price tag. Although the framework allows the mortgage interest deduction to remain in place, the near doubling of the standard deduction will cover most tax filers who would have benefitted from this particular itemized deduction. But the elimination of the SALT deduction is key to raising revenue used to finance the lowering of tax rates, as well as an important piece of tax simplification. It's also a matter of fairness. Federal tax filers are essentially forced to subsidize the high tax burdens of states like California, Illinois, New Jersey, and New York. Tax filers in these four states alone claim roughly 44 percent of all SALT deductions. As Andrew Moylan and Andrew Wilford of the National Taxpayers Union Foundation recently explained, lower and middle class tax filers tend to lose when states increase taxes because, unlike higher income earners, they don't stand to benefit from SALT. "Yet while states have this incentive to increase taxes, taxpayers who take the standard deduction do not receive a corresponding write-off," Moylan and Wilford wrote. "Since taxpayers claiming the standard deduction tend to be less wealthy; state tax increases can fall more heavily on the backs of lower-income taxpayers. States are encouraged to raise taxes, but the majority of less-wealthy taxpayers do not receive any offsetting benefits when states do so." A cap on the deduction will still bring in revenue that could be used to finance lower tax rates. A December 2016 report from the Congressional Budget Office estimated that capping the SALT deduction at 2 percent of adjusted gross income (AGI) would increase federal revenues by $955.4 billion over ten years. An income cap at $400,000 would increase static revenue by $481 billion, according to the Tax Foundation. Full repeal, however, would eliminate a $1 trillion tax deduction that could be used to pass pro-growth tax reform and send a message to states that the federal government is no longer subsidizing their addiction to big government.